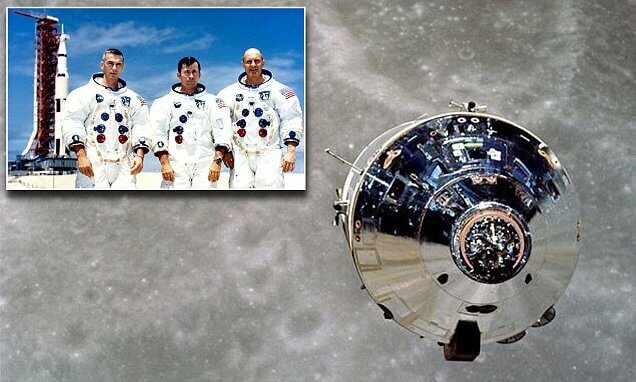 Apollo astronauts who orbited the moon two months before Neil Armstrong’s famous 1969 landing heard mysterious and unexplainable ‘music’ on its far side, out of the range of Earthly radio transmissions, it has emerged. Recently unearthed recordings made by NASA of the journey, which took the Apollo 10 capsule around the far side of the moon, show the astronauts reacting with surprise and confusion to an unearthly howling noise in their headsets. The sound began once the capsule was on an hour-long trip around the far side of the moon, out of the range of any Earth broadcast. At one point the baffled astronauts can be heard discussing whether they should tell NASA command or not. ‘You hear that? That whistling sound? Whooooooooo!’ one of them says. ‘Well, that sure is weird music,’ his companion agrees. And no, the ‘music’ was nothing to do with Pink Floyd’s The Dark Side of the Moon, which was released four years later. The sounds lasted almost the whole hour that the capsule was on the far side of the moon, and back on Earth the recording was shelved by NASA until 2008, when it was declassified. Now it has resurfaced in the upcoming third season of Science Channel’s series, NASA’s Unexplained Files. The show discusses some of the possible solutions, which include a magnetic field or atmosphere interfering with the radio — but according to experts in the show, the moon has no magnetic field and not enough atmosphere to cause such issues. The origins of the noises may, it seems, remain a mystery. A sneak preview of the the third season of NASA’s Unexplained Files screens on the Science Channel on Sunday February 21 at 10 pm; the series proper returns on February 23. Scuba Divers Find A Giant Orb In The Ocean. What Is It? !